This document is a complete schedule of all the different cycles you will go through for the next few months. The interpretation of your main planetary transits is presented chronologically. You can see planetary events with their periods and dates of transit. The study of the astral climate is a keeper and you can use it anytime in order to control your destiny. The texts of these astrological analysis were written by the astrologer Patrick Giani. 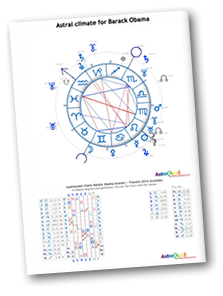 This astrological study of about 20 to 40 pages (10 to 20 pages for 6 months) includes many color charts and ephemeris' tables. starting from only 15.85 CH F, including all charts and personal table of transits !